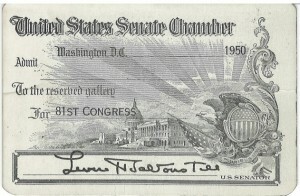 Bill expected to receive his BSEE from Northeastern University in February 1948 and prepared his resume for potential employers. 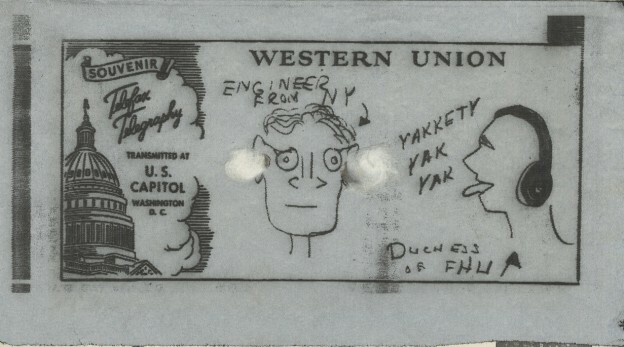 He graduated on January 31, 1948, and went to work the next week for the Western Union Telegraph Company (WUTEL) at the 60 Hudson Street headquarters in New York. As an Engineer in the Facsimile Telegraph Group of the Apparatus Engineering Department, he participated in the design and development of several mobile and fixed facsimile telegraph systems, including the “Telefax Deskfax” system, which achieved widespread use. His development work included the design of relay control circuits, transmission line testing, equipment layout, and coordination of design with the Time Study, Operating, Maintenance, and Plant Departments. Here are photos of the DeskFax Engineering prototype, with a model showing how it was used. Bill supervised the installation, initial testing and operation of systems in 8 major U.S. cities, and wrote maintenance and operation manuals and conducted the two-week course of instruction for maintenance personnel at each installation. 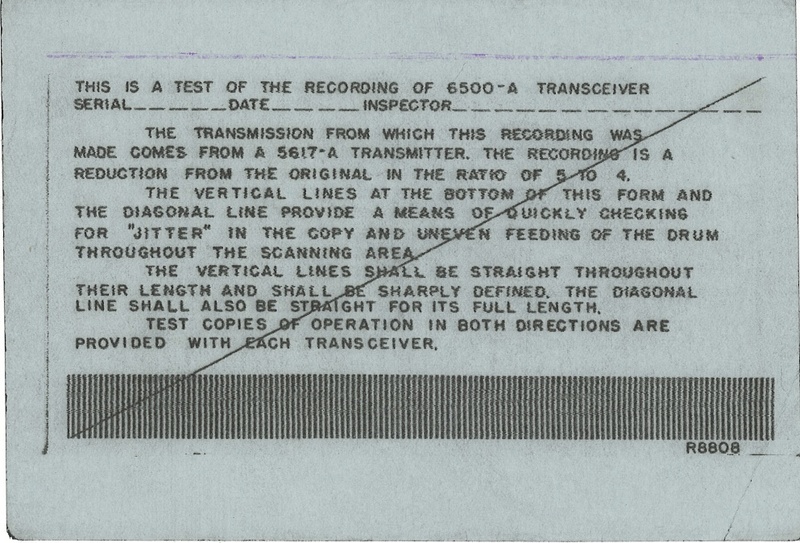 He also prepared the test samples which were used to tune the link, including the two below. He also was on the Carnation Milk radio program broadcast from KNX, the CBS clear channel radio station in Los Angeles. Two photos taken by CBS from the show are below. 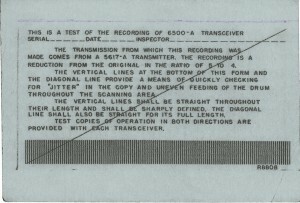 The photo on the left shows Bill at work on a transceiver, and he is the man on the right in the photo to the right. Note how everyone was wearing a carnation boutonneire. Of course, there was press coverage, too, such as this Los Angeles newspaper clipping which touts the ease of use without any training. Western Union had an extensive nationwide system of message centers linked by cables, and supported by a staff of operators, printers and messenger boys, as shown in this WUTEL Telegraphy System brochure. 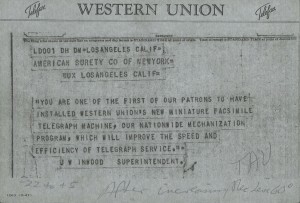 Bill would often talk about how Western Union responded to economic drivers. 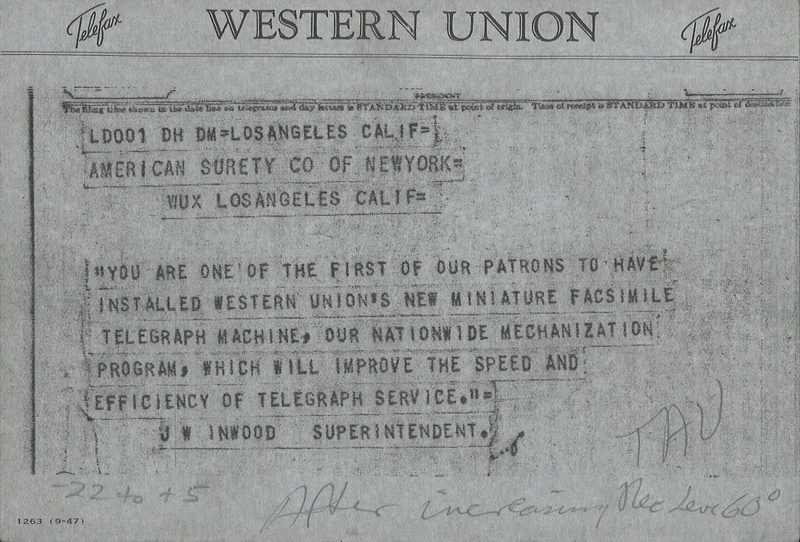 In the first place, the minimum wage had driven up the cost of Messenger Boys to deliver telegrams from the WUTEL office, which drove the adoption of the teletype. 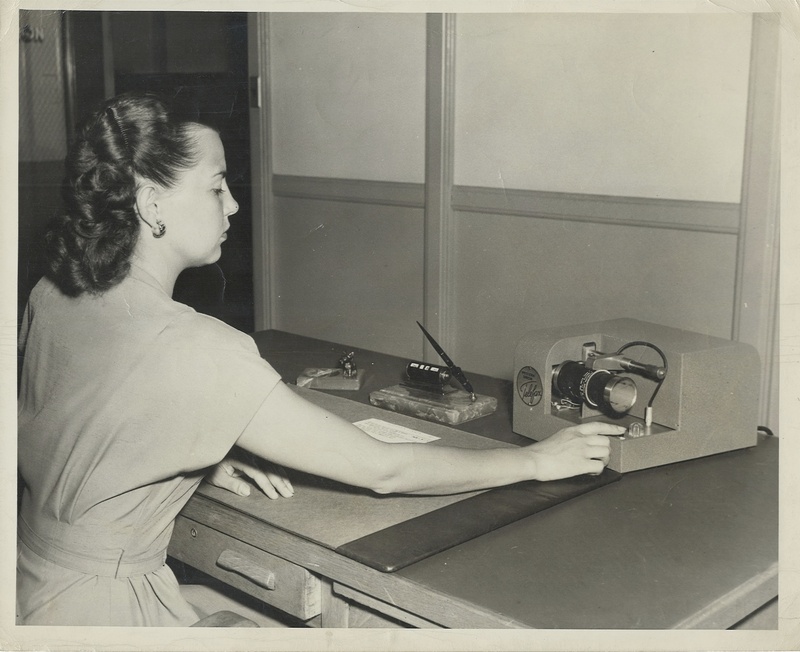 But women who operated teletypes got paid more than regular secretaries, and WUTEL believed that the DeskFax would be economically attractive to companies, because anyone could send a fax. And of course there was the special ‘Teledeltos’ paper, which companies had to purchase from WUTEL — essentially making this a razor blade business. 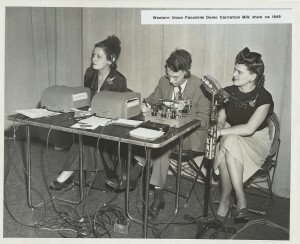 This job also gave Bill a chance to travel across the country by air and rail, including a stop in San Francisco in 1950, where he had a drink at The Top of the Mark, and also got to see his Great Aunt Nelly Lyons Brackett at her home in the Twin Peaks, and whose husband Jack ran a tavern on Market Street. 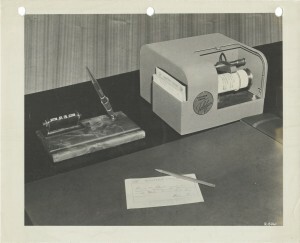 In the spring of 1950, Bill had the opportunity to set up a DeskFax system in the Senate office building. 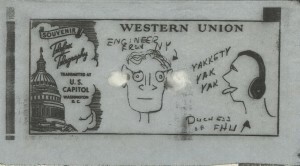 To help promote the DeskFax system, WUTEL provided Capitol Souvenirs, which explained facsimile and also included an example fax that would be mailed to you as a keepsake. This one shows how much more flexible fax was than telegraphy, and captures a chatty secretary that forced Bill to plug his ears with cotton. [The cotton was apparently glued on by the chatty Dutchess of FHU]. 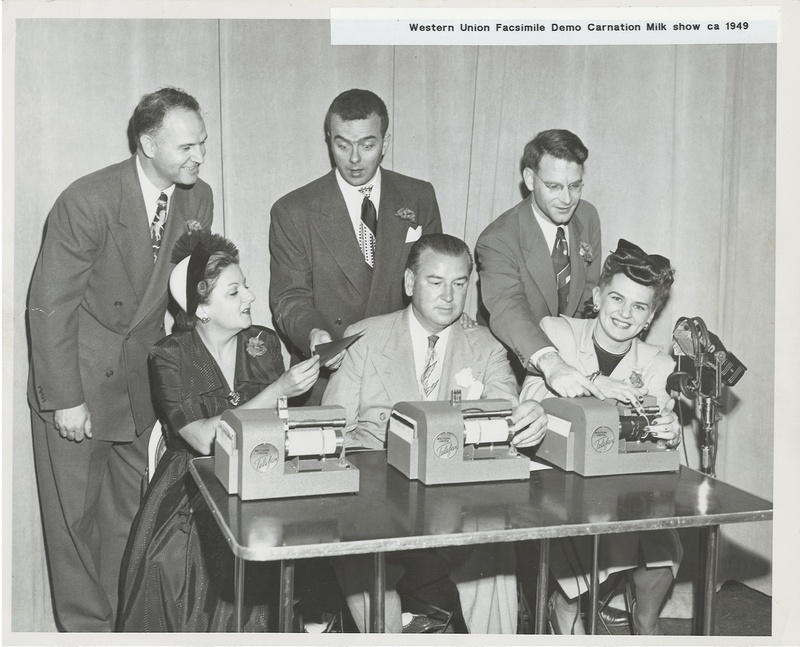 Bill left WUTEL near the end of 1950. 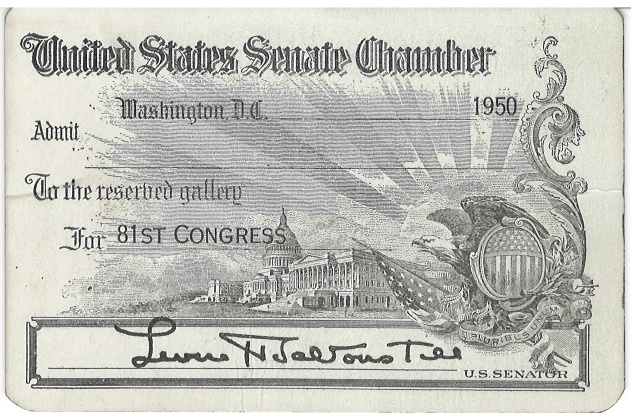 Here is one of his final paystubs. 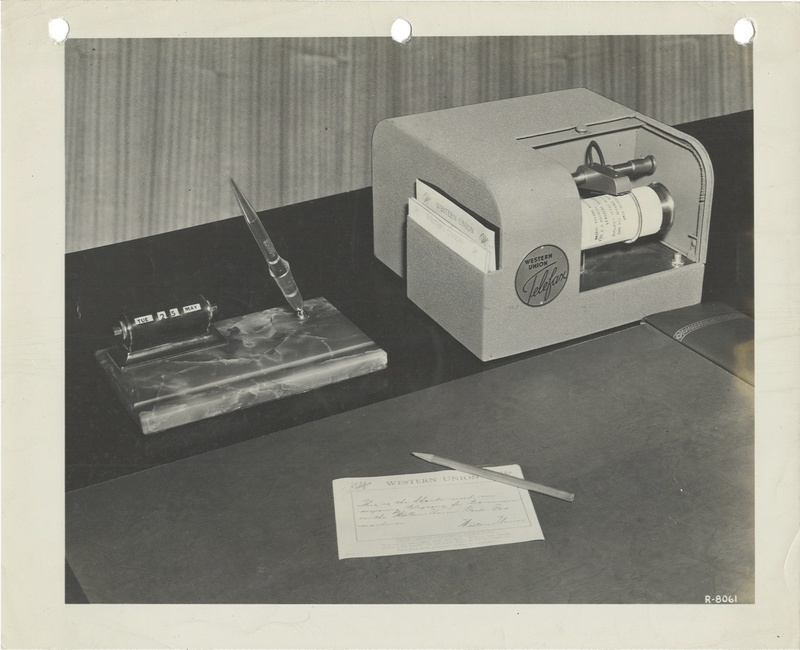 Western Union discontinued DeskFax service in the 1960s as facsimile services moved to the telephone system. Although DeskFax units survive as artifacts from that era, they are inoperable without the central office equipment. More information on DeskFax is available here. Cool before it was cool to be cool! And worked with those fax machine. They nothing like the fax machine today. They used to smoke and your hands would be all black from the fax paper.